UNIT 1 OHAP UNEMPLOYMENT INFORMATION: You must file for unemployment online at http://unemployment.ohio.gov or if you do not have internet access, call 1.877.644.6562. ODJFS business hours are 8:00 AM – 5:00 PM Monday – Friday, except holidays. Use MASS LAYOFF # 1700273. Your last day worked will be 05/12/2017 and your return to work date will be 10/02/17. UPDATE TO TEMPORARY LAYOFF INSTRUCTIONS: THE ODJFS HAS APPROVED OUR WORK SEARCH WAIVER, which means you will not be required to seek work during the tEMPORARY LAYOFF. if you are prompted to enter information about jobs when you file, you need to hang up or disconnect and call your processing center. TEMPORARY LAYOFF INSTRUCTIONS: On Sunday, May 14th, open or restart your claim. On Sunday, May 21st, file a claim for week ending May 20th. On Sunday, May 28th, file a claim for week ending May 27th. Continue filing until you return to work. If you go to claim your week and the correct week ending date is not listed, disconnect and call your processing center to file your claim. The number to your processing center can be found on your paperwork from the ODJFS. WAITING WEEK INFORMATION: Unit 1 members who were on layoff status and serving their waiting week will be denied unemployment. 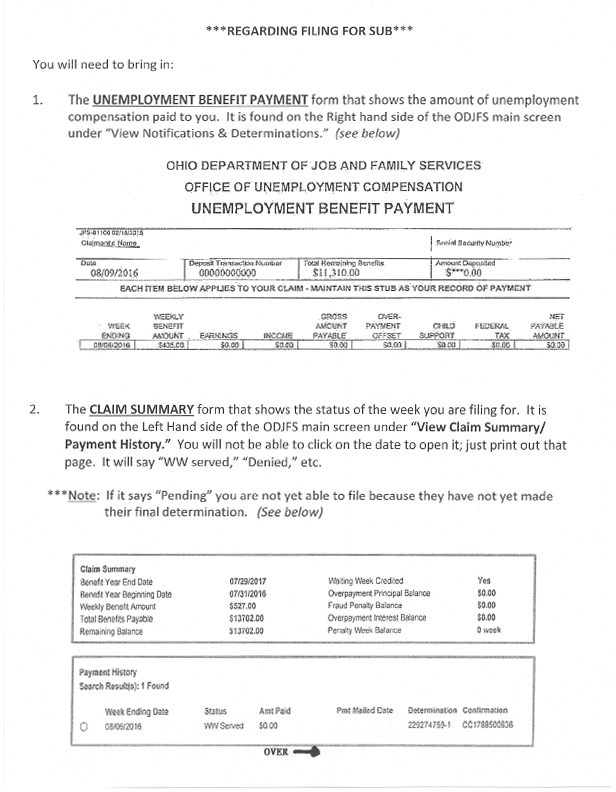 You must go to the ODJFS web site and print your unemployment benefit payment documents showing ZERO amount paid as well as the document under the “Claim Details” section, “View Claim Summary/Payment History” that shows “WW Served” as the most current status and take them to Human Resources to sign up for your SUB pay. Please see examples on reverse side of this bulletin. Signing up for SUB this time will start your auto SUB for one year in the event of future layoffs.